IPL 2019 Mumbai vs Bangalore: Mumbai Indians beat Royal Challengers Bangalore by 5 wickets, RCB register 7th loss in 8 matches: Mumbai Indians thrashed Royal Challengers Bangalore by five wickets in a nail-biting match on Monday. Hardik Pandya's 37 off 16 balls snatched away victory from RCB. Rohit Sharma-led team chased down the target with an over to spare. Lasith Malinga was adjudged player of the match for his dismissing four wickets. IPL 2019 Mumbai vs Bangalore: Mumbai Indians beat Royal Challengers Bangalore by 5 wickets, RCB register 7th loss in 8 matches: Again, Royal Challengers Bangalore failed to prove the capability of the team as they registered 2019 IPL’s seventh loss in the eight matches. RCB bowlers could not defend 171. All thanks to Hardik Pandya who scored 37 of 16 balls and pocketed two more points for Mumbai. Bangalore have only won one match out of eight in the IPL 2019. They clinched victory over Kings XI Punjab in the last match. While Mumbai have won five out of eight games so far in the series. Mumbai became the first team which has defeated Bangalore 16 times in the IPL. Batting second, skipper Rohit Sharma and Quinton de Kick gave Mumbai a decent start. They scored 70 runs in seven overs. However, both the batsmen were dismissed in eighth over bowled by Moeen Ali. Sharma made 28 off 19 and Knock scored 40 off 25. After that Suryakumar Yadav (29 off 13) and Ishan Kishan (21 of 9) took the team near to the victory. Mumbai needed 22 in the last two overs. But lower middle order Hardik Pandya completed the chase in the penultimate over off Paean Negi. 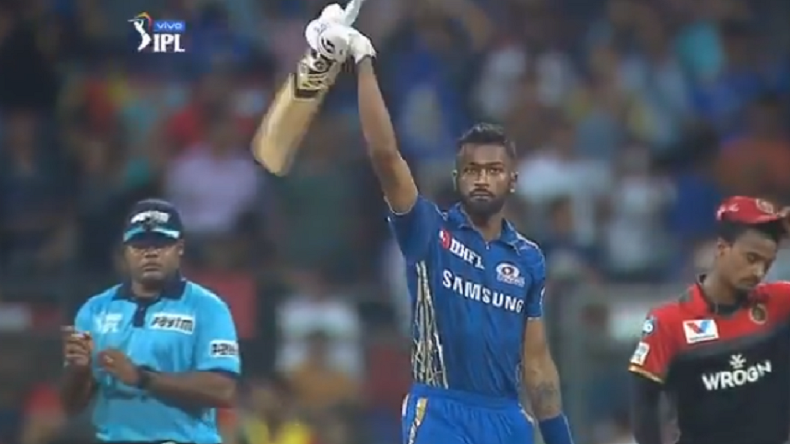 Pandya smashed two sixes and two boundaries and won the match for Mumbai. For Bangalore, Yuzvendra Chahal, Moeen Ali and Mohammed Suraj picked two, two and one wickets respectively. Earlier, RCB suffered first wicket loss for just 12 runs when skipper Virat Kohli was dismissed for eight runs. The second wicket fell for 49 runs. Parthiv Patel made 28 off 20. At the third wicket, Ab de Villiers and Moeen Ali made 95 runs and took the score to 144 in 17 overs. The last five wickets fell for just 25 runs, among these last three fell for a run. Three Bangalore batsmen were dismissed for none. Still the team posted 171 on the scoreboard. First with the bat and now with the ball, Moeen Ali seems to be having a great day on the field. For Mumbai Malinga claimed four wickets while Jason Behrendorff and Hardik Pandya took one each. Amit Shah meets Sunny Deol in Pune: BJP to field Ghatak actor from Amritsar? Should the Congress form alliances or not? HPBOSE Class 12 Results 2019: Where and how to check Himachal Pradesh Board results?